Preparation for "Moules marinières": Wash the mussels in running water and use a knife to remove any algae. Discard any open or damaged mussels. Brown the finely chopped shallots and onions in a Cocotte, add the white wine and add the pepper corns with the mussels and the parsley stalks. Cover and cook for a few minutes on a high heat. Gently shake the Cocotte every few minutes. 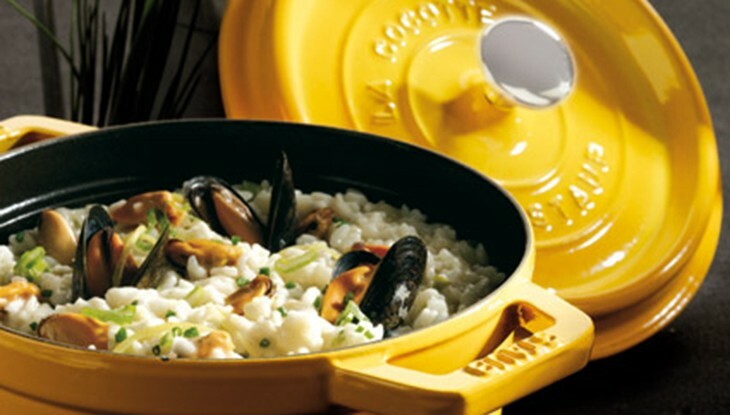 As soon as the mussels have opened, remove the pot from the heat and let it cool. Remove the mussels from the shells and set aside. Preparation of the broth: Heat 600 ml water in a pot and add the stock cube. Squeeze the lemons, remove the peel with a potato peeler and blanch three times in a pan with boiler water until it is cooked. Finely cut the onions with a touch of greenery and brown in a frying pan with a little butter. Slowly melt the butter in a Cocotte, add the rice and pour in 2/3 of the broth. Simmer for 12 minutes. Then remove the pan from the stovetop, add the white wine and let it stand. Before serving warm up the rice for 6-7 minutes while stirring in the rest of the broth. Add the lemon juice, cooked lemon peel, mussels, chopped chives, Parmesan and onions. Whip the cream and stir it in at the very end to give the rice a creamy texture. Let the risotto stand for a few more moments until all the liquid has been absorbed.